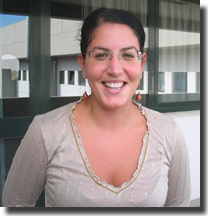 Stefania Marrazzi was born in Novoli(Le), on the 11th August 1977. She has a degree in Materials Engineering with biomedical materials specialization, at the University of Salento, on the 20th April 2006. The thesis is in Transport Phenomena subject and its title is: Influence of the moisture about the epoxy resins properties used to structural restablishment of building works. In the same year she obtained the Professional Abilitation to exercise the Engineering Profession. From March 07, she carries out a research project in the textile field at the Department of Innovation Engineering. This project is about the mechanical and surface characterization of chemically modified fabrics in collaboration with Barbetta s.r.l. in Nardò (Lecce). Form April 07 she carries out a doctoral activity in the textile sector too at the University of Salento. The research subject is about the fabrics used for the drugs and fragrances controlled release.